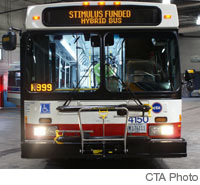 The Chicago Transit Authority today announced the arrival of the first of 58 New Flyer articulated hybrid buses purchased with federal stimulus funds. The new buses, purchased at a cost of $50 million, will continue the 4000-series numbering that began with the lease of 150 buses of the same model last year. The buses are mostly identical in design and mechanics to the earlier deliveries, with the exception of the seating. Rather than the InSight seat from American Seating present in previous deliveries, the CTA opted to install the Aries 4MA seat from USSC. This same seat design was previously tested in Nova LFS #6462. All 58 buses are scheduled to arrive by fall and will bring the total number of articulated hybrid buses in CTA’s fleet to 208. CTA estimates that the hybrid technology will save over $7 million a year in parts, fuel, and labor. The buses will mostly fill the articulated bus fleet shortage following the early retirement of the NABI articulated buses. The NABI buses were pulled in February following the failure of a buses’ articulation joint.